Jungle Red Writers: Night and Day--Eclipse Safely! HANK PHILLIPPI RYAN: Happy Sunday! We all know what we are doing tomorrow, right? Eclipse day! Are you prepared? I am dying to see it, but nowhere can I find those eclipse glasses. Talk about not planning ahead, sigh. I keep thinking someone will come up to me and say--hey, Hank, want some ISO approved eclipse glasses? And I will say, oh. lovely thank you! So I am crossing my fingers. Seriously. If you are going to watch it raw, make sure your eyes are properly protected! I’m not quite certain what I will do about seeing the eclipse, but I definitely don’t want to miss the big event. I am in Virginia for another week or so, helping out and enjoying the newest grandbaby who is eleven days old today. Oh! Fabulous. Happy 11 day birthday, new grandbaby! Lovely! No glasses here, either. But Hank, there will be a totality in New England in just seven years. We both can start planning ahead for that one now! I'll be spending the day helping my lovely eight-month pregnant goddaughter and her husband move, and since both my sons are helping, too, it'll be an excellent day with all my favorite thirty-somethings. We have #14 welder's glass which we purchased from the Cincinnati Observatory. Unless we drop it, much sturdier than flimsy cardboard glasses. I tried it yesterday, as I looked directly at the sun. Magic! The sun had a green tinge, and a well-defined orb. Today we're checking out an eclipse viewing site in a nearby Hamilton County park, with an air-conditioned gift shop for breaks from the 90+ degree heat. And gardens...lots of gardens to peruse when we're not staring at the sky. Ooh. Just a piece of glass ? Wonder if I could go to the hardware store ? Welder's glass is an actual pair of glasses, I think. We got glasses from our local library. They are having an eclipse party tomorrow which we plan to attend. So cool! Can't wait to hear about it! I'll have the day off and am attending an eclipse viewing at a place that's providing the glasses! I am at home on this Sunday morning, about to get dressed and head out to mow the lawn. I've got to write the 2nd of two book reviews at some point today as well. The first one I wrote this morning was for yesterday's blog post here on JRW, author Kristen Lepionka. That is up on Goodreads. As for the eclipse, I honestly don't care about it so I didn't get glasses. I don't have pets so I don't have to worry about them either. When it is supposed to happen, I will be eating at the 99 since the boss is taking the office out for lunch. Today is the last of a four-day work break for me, but it looks like I'll be taking one of my cats back to the emergency vet. She's been ailing since Friday and, although she seems a little better, she's getting dehydrated. As for the eclipse, I'll be back at work tomorrow. I know my boss got eclipse glasses. Perhaps he'll share. Yes -- great idea. Maybe I'll just stroll our neighborhood and see if anyone will share ! No glasses here, either, but we will be outside, watching the ground. Don't forget to look at the shadows as the sun eclipses, because they are SO interesting. But first today: farmer's market! We have the best Sunday market of any I've been to, except in Europe, and I'm finally at home to go. Hank, I sent you an email with my address. Hope you got it. Enjoy the conference! I did, Karen! And she is sending your book! And eager to see the shadows.. I'm curious about what they'll be! I failed to plan ahead, so no eclipse glasses for me. I know this is terrible to admit, but I just don't feel the excitement level about the eclipse that others seem to be feeling. I can't be the only one, right? Today is a lazy day, which is a nice break from recent travel. We're having some painting done this week so the living room is strewn with color samples, and I need to make some decisions. I'm trying to work out some book problems, and I'm hopeful that my "back brain," as Chevy Stevens refers to it, will come up with some solutions! I'm with you, Ingrid. I've seen eclipses before, and I'm not in the path of totality. I'll probably wander out to look at the shadows, but it's okay if I don't. I thought of eclipse glasses last week, and Julie called around to our libraries, found some and got four pair so our neighbors can have them too. Again I am touting Erin Kelly's HE SAID SHE SAID, best (only) eclipse-based mystery I've ever read. And she isn't even paying me to do this. Also, it is not true that I am her grandmother. We will watch from our garden as that's about as far from the recliner I am travelling these days. Tomorrow is a double holiday for me, as it is my mother's birthday. She would be 100 years old, born at home in Billings, MT, on a homestead. My how life has changed and stayed the same. She was born during the war to end all wars, and now we have the president to end all presidencies. Hmmm. Today, being Sunday, I'm devoting to the NYT, particularly the book review. I took Hank's recommendation and am reading, just about finished, Michael Connolly's THE LATE SHOW. Wow, I can see I have a lot of catch-up reading to do. It was 66 when I got up this morning but is headed toward 90, so we will close up the house and turn on the AC for the second time in August. Don't tell me you hate snow and would rather put up with the heat. It just isn't true. You can always put on another sweater, another cat, but once you're nekkid, there's nowhere further to go. Look at the beautiful hot day with temps over 100 ... said no one EVER. PS, someone please tell me if I won a book. I don't have the patience today to read thru all the past weeks blogs. Did I mention I have an ARC of GLASS HOUSES waiting in the wings? Just so you know. So you're definitely recommending THE LATE SHOW? I thought about it when I saw it in the bookstore the other day, but opted for something else instead. I'll go back if you tell me I must. And your garden sounds like the absolute perfect place for eclipse watching. Enjoy! Your mother shared her birthday with my husband. He would have been 72. Definitely Gigi. I'm not so much a fan of police procedurals but I think he knocked this one out of the park. We'll raise a glass to Warren and Esther tomorrow. I loved it, too! And so pleased you enjoyed it. AZ actually enjoyed a partial solar eclipse back in 2012, so we're kind of meh about it. Been there. Done that. We did do the pinspot thing and it was pretty cool! I have pictures of the eclipsed sun on our clothes. So fun! Enjoy all those who can see it! AZ gets a partial view again. Portland is just outside totality, I'll be around 99% in my daughter's backyard. Her 8 year old is extremely excited to have us all together for the experience. Daughter exercised great foresight and secured eclipse glasses a couple months ago. I remember the 1969 total eclipse in NY. That was a fun party in Central Park. Anyone else attend? Remembering the 1969 eclipse reminded me of a Viking character who was there. He was always around the Park in those days. I couldn't remember his name so I did a quick Internet search. His name was Moondog, and although I always thought he was homeless it seems he was a musician and an inventor. I thought I would share a link to Moondog here in celebration of someone who shared that long ago day with us when the moon's shadow covered the sun. https://en.wikipedia.org/wiki/Moondog. And yes, I am eager to see what the birds do, too! Weatherwise it isn't looking good for tomorrow. Clouds and rain are predicted. If the sun breaks through at the critical times I'll check the eclipse indirectly. I'll view it by using a colander over a piece of white paper. Each hole will be an eclipse picture. You adjust the height of the colander to get a clear picture. The smaller the holes the better. You will be looking DOWN on the ground, not up at the sun! I haven't tried this but the astronomer at our natural science museum recommended this as one of the ways to view the eclipse. And who doesn't have a colander? And we will have another shot at a better one for my location in seven years. If I'm still living here! Our granddaughter will be flying home to Ohio tomorrow and should fly right through the eclipse. How cool is that? So cool ! I will try the colander! Won't we look funny? We don't have the total eclipse either, but now I am going to go out with my Ritz cracker pin box and a colander! I've read part of the NUT, and now we are bathing the dogs on the deck. This is a BIG project, because of the drying part. Which we do with the shop vac, lol! Rick has made a pinhole box, so that's our plan for tomorrow. Walmart had simply barrels of the glasses six weeks ago, but are now sold out. Here in Portland, we'll get 99% of the totality, but that's plenty. Unfortunately, I will be at a 10:00 doctor's appointment. They changed it a month ago, and without thinking about the eclipse, I said "sure." So I'll miss the goof part. Tell the doc you need to go outside! She/he will be thrilled to join you! I just finished the book He Said/She Said by Erin Kelly early this morning, a book I was determined to read before the eclipse, as it is the definite "it" book with its eclipse feature running throughout it. 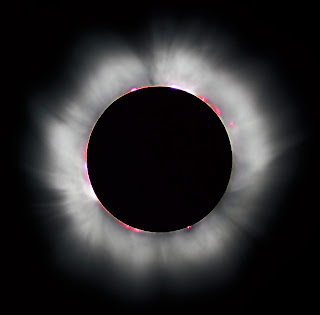 It begins and ends with a total solar eclipse. Ann mentioned it above, and I agree that it is quite a thrilling read. We are at 99% totality here. I'm close to the totality areas, the 70 mile swath, and I could drive under an hour to a totality site. But, I think I'm going to stay put, just not sure I want to put up with the crowds and the traffic, although I'm a little disappointed in myself that I can't muster up a more adventurous spirit, especially after reading the above book in which totality chasers go all over the world in pursuit of a solar totality viewing. I do have glasses, but they were bought at a premium on Amazon. They are the certified ones. I haven't decided if I'm going to go anywhere other than my yard. A friend and I talked about what to do or where to go, but we will be in touch again later today. My daughter is taking the almost eight-year-old (turns eight next Sunday)out of school, and granddaughter and her father are traveling from southwestern Indiana to Illinois to view the total eclipse. Daughter and other granddaughter will be teaching and attending school. See how you feel tomorrow! And eager to hear what your granddaughter thinks! The thunder storms usually roll in right about the time of the eclipse, so I didn't get to excited. I remembered the pin hole trick from when I was little. In 1953, partial eclipse in Seattle. The colander idea sounds neat, might try that if not rained out. Guess this one is special because it is the first time the totality has gone across the US since 1918. Today was spent smoking eggplant, + tofu + a red fish in the hibachi. I am smoked too; that was not intended. I'll be working hard tomorrow, and it's not that close to me. I'd love to see it, but I'm like you, completely unprepared, so it won't happen. Hallie's winner .Sally from PA.